This is the perfect product for general Home and Garden use. It is a high volume item. Features: High Density, Rip Resistant Polyethylene Material, UV Resistant, 4-5 mil. Thick, 8x8 Weave Count per Square Inch, 1000 Denier, Lightweight, Approximately 3.1 oz. per Square Yard, Heat Sealed Seams. Rope-lined, Heat Sealed and/or Double Stitched Hems, and Aluminum Rustproof Grommets Approximately 3 Feet Apart and in Each Corner. 12ft. x 16ft. 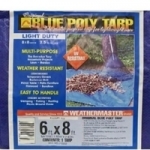 Lightweight Blue Poly Tarp. Features include: High Density, Rip Resistant Polyethylene Material, UV Resistant, 4-5 mil. 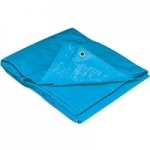 Features include: High Density, Rip Resistant Polyethylene Material, UV Resistant, 4-5 mil. Thick, 8x8 Weave Count per Square Inch, 1000 Denier, Lightweight, Approximately 3. The Dize Weathermaster tarp is the perfect product for general Home and Garden use. The perfect product for general Home and Garden use. The tough WEATHERMASTER (tm) Brown Poly Tarp comes in a range of sizes and is lightweight, easy-to-handle. 12ft. x 16ft. Lightweight Brown Poly Tarp. Features: High density, rip resistant polyethylene material. 12ft. x 20ft. Lightweight Brown Poly Tarp. Features: High density, rip resistant polyethylene material. The Bull Flex has reinforced web-loop handles every 3' which are 3 times stronger than grommets! A pipe pocket runs the length of the tarp and allows for optional use of pipe. Each end of the tarp has 2 seatbelt webbing to secure the ends from wind damage. The special coating protects the tarp from rot, mildew and UV damage. The average life-span is 3-5 years of continuous normal use with proper installation and regular retightening. 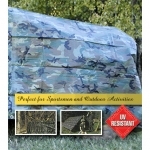 This tarp is the perfect product for the sportsman and homeowner. Designed to meet the requirements for a lightweight, easy to handle cover. Made from single filled cotton duck. Canvas tarps are one of the best protective coverings which are breathable and allow moisture to evaporate. This 10 ft. X 12 ft. 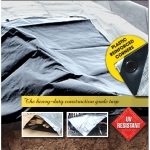 Heavy Duty Silver/Black Tarp is designed for rugged use and continuous outdoor exposure. Both the Black and Silver sides are UVI treated for extended use in sunlight and are heat and cold resistant. The Black side of the tarp will absorb heat and divert ultraviolet rays. The silver side of the tarp reflects the sun&#39;s harmful rays. 12x16ft heavy duty silver/black poly tarp is designed for rugged use and continuous outdoor exposure. Both the Black and Silver sides are UV treated for extended use in sunlight and are heat and cold resistant. The Black side of the tarp will absorb heat and divert ultraviolet rays. The silver side of the tarp reflects the sun&#39;s harmful rays. Tarp has 18 inch grommet spacing and black reinforced corner patches. 12x20ft heavy duty silver/black poly tarp is designed for rugged use and continuous outdoor exposure. Both the Black and Silver sides are UV treated for extended use in sunlight and are heat and cold resistant. The Black side of the tarp will absorb heat and divert ultraviolet rays. The silver side of the tarp reflects the sun&#39;s harmful rays. Tarp has 18 inch grommet spacing and black reinforced corner patches. 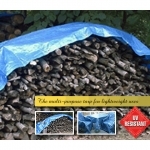 This tarp is designed for rugged use and continuous outdoor exposure. Both the Black and Silver sides are UVI treated for extended use in sunlight and are heat and cold resistant. The Black side of the tarp will absorb heat and divert ultraviolet rays. The silver side of the tarp reflects the suns harmful rays.